The Lord of the Rings is the centerpiece of Tolkien's writings. It is a massive epic that moves the reader across the magnificent landscapes of Middle-earth and introduces us to one of the most remarkable arrays of diverse characters in all of literature. Based solidly on Nordic mythology, the saga is brimmimg full of heroic archetypes, dark forces of evil, ethereal Elves, noble peoples who are easily corrupted, powerful wizards and, of course, brave and fun-loving hobbits. Tolkien's mastery is in his exquisite attention to detail throughout this epic narrative. Besides creating unforgetable characters, he has painted a rich canvas of extraordinary places that you will want to visit again and again. Most readers find that one reading of The Lord of the Rings is most definitely not sufficient. You will find yourself drawn into Tolkien's magical world, and walking the paths of Middle-earth with your old friends, time and time again. The Fellowship of the Ring: The first book of Tolkien's trilogy can be likened to a travel guide to Middle-earth. You will visit such memorable places as the Shire, the Old Forest and Barrow-Downs, Rivendell, the Mines of Moria and Lothlorien to name just a few. You are also introduced to the members of the Fellowship as they begin their quest to destroy the One Ring. The Two Towers: In the second book of Tolkien's trilogy, war comes to Middle-earth. The dark forces rally to the two embodiments of evil...Saruman the Wizard, and Sauron the Dark Lord of all evil. The Fellowship is divided and on three different quests that will ultimately leave them confronting the powers of darkness on their own paths. We are introduced to the beleaguered people of Rohan, and to the Gondorian army in Ithilien, led by their brave and resolute Captain, Faramir. The quest to destroy the One Ring continues in riveting fashion. The Return of the King: The third and final book of The Lord of the Rings brings all of the cataclysmic events in the battle for Middle-earth together in heart pounding and bittersweet conclusion. Brave men are lost in battle. Innocence is lost forever. Evil is destroyed. Love blossoms anew and star-crossed lovers are re-united. A new King is crowned. Friendship and loyalty win the day. Tolkien's Third Age concludes and the Fourth Age begins, and we are most reluctant to leave behind these wonderful characters in the magnificent world that is Middle-earth. The Appendices: These final writings of the book are absolutely crucial to the full understanding of the story of The Lord of the Rings. Of utmost interest are the writings on The Tale of Aragorn and Arwen, The House of Eorl, and The Tale of Years. One can not truly finish their reading of this great classic of English literature without a thorough reading of The Appendices. © 1954 & 1965 by J.R.R. Tolkien. 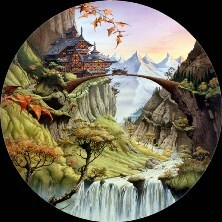 Images © Rodney Matthews.